Important! 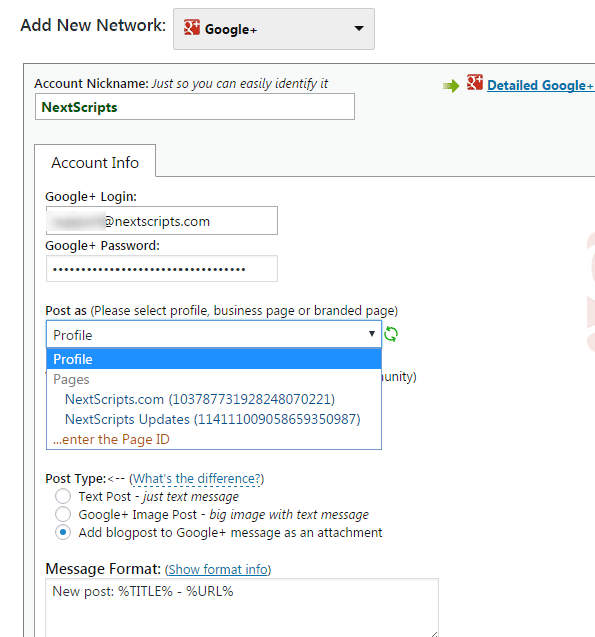 Google+ don’t have a built-in API for automated posts yet. You need to get a special API library to be able to post to Google+. Personal account (such as @gmail.com account) will not work. Google+ for G Suite will continue to exist. SNAP works fine with G Suite accounts, so please use only your G Suite login here. SNAP can autopost to your profile, business/brand pages, collections, and communities. SNAP can also autopost to collections and communities as business/brand page. 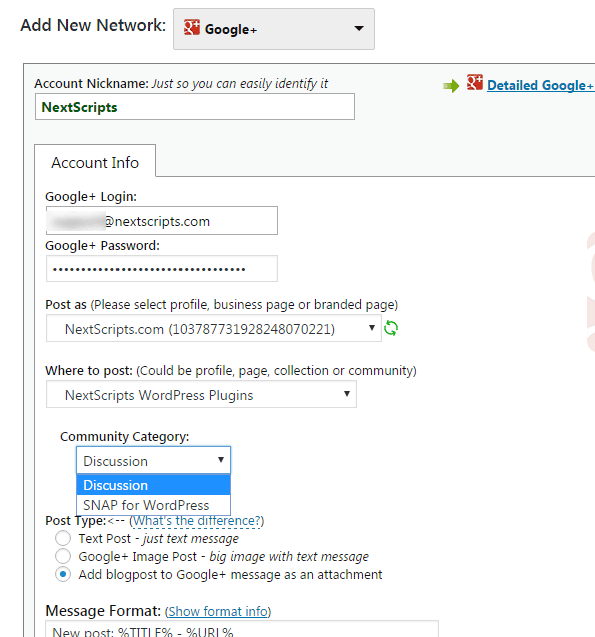 Connect Google+ to your WordPress. 2. Click green “Add new account” button, select “Google+” from the list. 3. Fill Google+ Login and Password. 4. Click green refresh button. 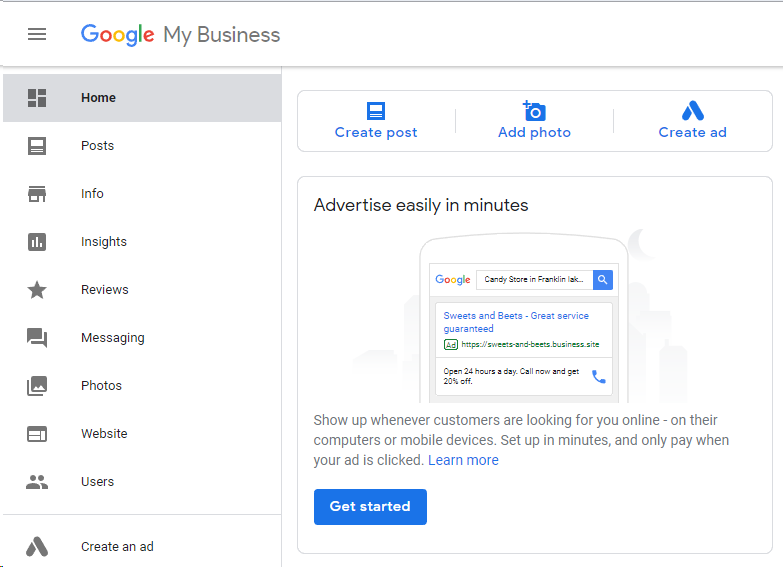 SNAP will establish a connection with Google+ and retrieve the list of your business/brand pages. Select either “Profile” or one of the business/brand pages in the “Post as Field”. 5. SNAP will retrieve the list of your or your page’s collections and communities. Select where you would like to post. 5. Your Google+ account is ready to use. 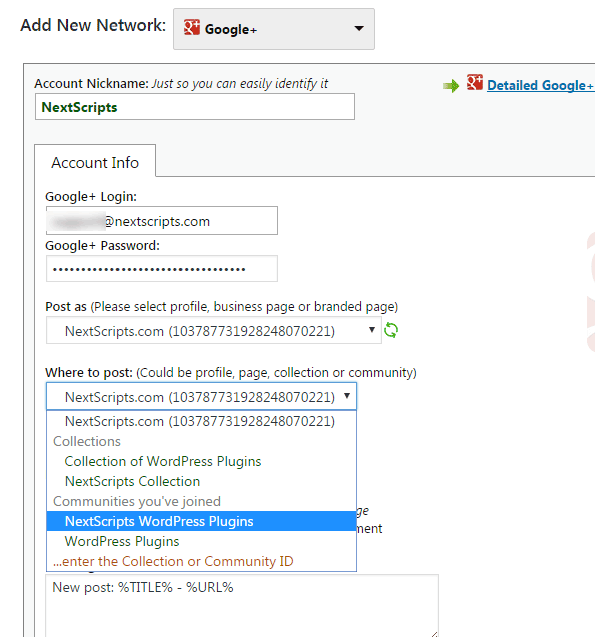 If you choose one of the communities at the “Step 5”, plugin will retrieve the list of categories for that community. Please select one of them. If you would like to post to your profile, please select “Profile” in both “Post as” and “Where to post” fields. 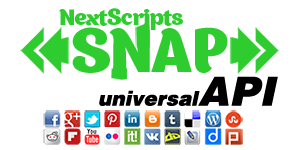 If you would like to post to your business/brand page, please select that page in both “Post as” and “Where to post” fields. 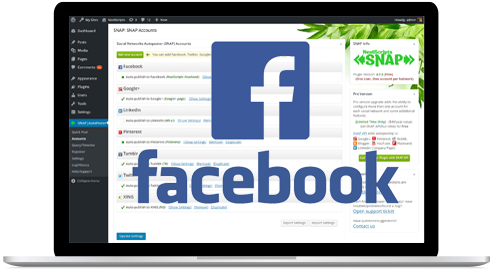 You need SNAP WordPress plugin version 4.2.7 or later. 1. Open Google account settings in the plugin. 2. Click "Use Session" to see the session fields. We recommend you to open an "Incognito" window in your browser, login, get a session ID and close the window. Then you can open another "Incognito" window for the next account. Just please don't ever click "logout" button. 1. Login to your Google+ account in any modern Browser (Chrome, Firefox, Edge, Safari). 2. Open Development console. Press F12 or do a right click and select "Inspect" or "Inspect Element" from the menu. 3. Open a tab with stored page items. That tab called "Storage" in Firefox, "Application" in Chrome and "Debugger" in MS Edge. 4. Click on "Cookies", then on "https://plus.google.com/"
5. Find a cookie with the name "SID". Double click on the value and copy it. 6. Paste access_token value to the "SID Token" field in the plugin. 5. Find a cookie with the name "SSID". Double click on the value and copy it. 6. Paste userid value to the "SSID" field in the plugin. 7. Find a cookie with the name "HSID". Double click on the value and copy it. 8. Paste userid value to the "HSID" field in the plugin. 7. Save Settings, try to post. You are done setting your SNAP Wordpress plugin.